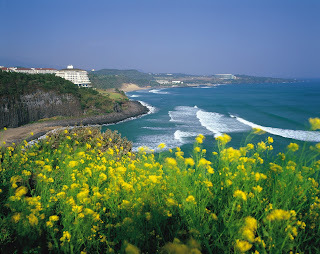 Jeju Island, also known as the 'Island of the Gods', located at the tip of the Korean peninsula and very close to Japan. Thus, the island is not only popular among the Korean community, but also citizens of Japan. This place is not infrequently used as a place for a honeymoon destination for Korean couples who recently married. Blend of volcanic rocks, the intensity of the rain that often falls, and the weather conditions are moderate, making the island of Jeju Island seemed like Hawaii, USA. 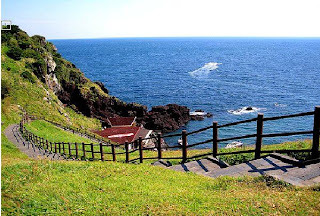 Jeju island become one of famous Korea tourist attractions. Variety of activities that can be enjoyed by visitors, including hiking Halla-san (the highest mountain peak in South Korea), enjoy the sunrise and sunset on the beach, see the sights of waterfalls, riding horses on the beach, or just lying on the sandy beach. One of the attractions that can be visited here is Jeju Glass Castle, a greenhouse were the work of professional artists. There are beautiful beaches such as Geumneung and Hyeopjae.yang share because they are located adjacent scenery. Due Geumneung tend not widely known, this beach is perfect for those of you who want to enjoy a quiet and more private environment.